Roberta Mitchell holds an autographed Donovan Mitchell shoe the Jazz Great gave her prior to the Jazz game against the MIlwaukee Bucks Saturday evening. Roberta Morgan of Logan is in basketball heaven. Donovan Mitchell shakes hands with Roberta Morgan Saturday before the game against the Milwaukee Bucks in Salt Lake City on Mar. 2, 2019. She made national news Saturday evening at the Utah Jazz game against the Milwaukee Bucks. 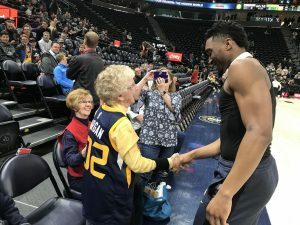 Jazz star Donovan Mitchell took off his shoes, autographed one and handed it to the 102 year old Jazz fan and gave her a hug. Morgan, who spent all but 18 years of her life in Logan, was surprised when the Utah Jazz Bear came pounding on her door last Thursday, minutes before the Utah Jazz basketball game. He gave Roberta a Jazz jersey with the number 102 on the back and invited her to Saturday’s game. It’s been a couple of days since the game and she still has a big smile on her face and gleam in her eye. “That was great,” she said of the game. Jazz games are a sacred time for Morgan who has been a fan since the days when Stockton and Malone ruled the hard wood. The super fan Morgan bans all visitors from her home during Jazz games, even her Home Teachers when there is a game on television. Morgan had the pleasure of attending a game or two with her husband when the Jazz played at the Salt Palace, before he passed. She also got to meet Thurl Baily, Mark Eaton and Shawn Bradley, who even kneeling down towered over her. Then she was introduced to broadcast personalities Craig Bolerjack and Matt Harpring. She was also presented with a custom Jazz jersey with her name on it and the number 102.